Four Sister Lakes as some all these lakes are 4 lakes all next to each other with two of the lakes being connected and all of which are in Sheep Lake state lands. North Windmill (14.1 acres, elevation 1,011 ft) is north of Windmill Lake of course and is accessed via the same road as all four lakes in this post. 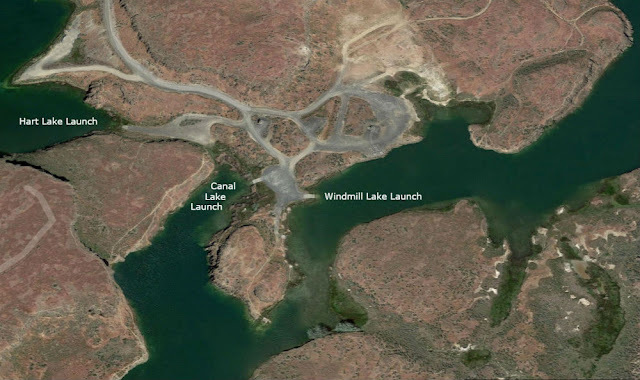 Windmill Lake (29.6 acres, elevation 989 ft) which is the north of Canal Lake (68.6 acres, elevation 988 ft) are connected to each other via a narrow channel. Hart Lake is to the west of the Windmill and Canal lake and is not connected to any other lake but the launch to this lake is only about 100 feet from the Canal Lake launch. All four lakes are excellent fishing lakes and home to numerous waterfowl. Kayaking and small boat sailing is also activities of choice on these lakes. North Windmill lake is technically the first lake off of the main road via its own gravel road, however if you stay on the main gravel road to the lakes. Hart lake is the first lake you will come to once you start down the road to the three lakes that are right next to each other. There is a nice camping area along Hart Lakes northeastern shore next to it's boat launch. To camp at Canal lake you will camp next to the shore of Windmill Lake. Fishing: All four Lakes were rehabilitated in 2010 to get rid of nuisance fish and then restocked with Rainbow Trout. Hart Lake also has Triploid Steelhead. Directions: One can drive to Canal, Hart, and Windmill lakes. One can drive to North Windmill Lake almost but then must take a short hike to the shoreline. 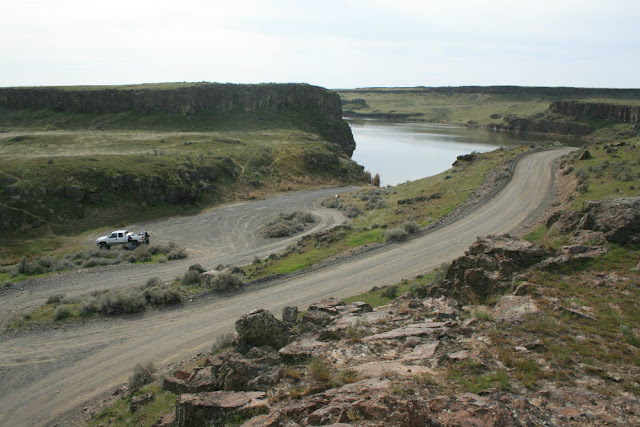 From Moses Lake take HWY 17 south toward Othello; turn right (west) on HWY 262/O'Sullivan Dam Road. Approximately 2 miles up the road on your left (south) you will see the entrance to Sheep Lake Rd. Follow this road all the way to the sign indicating Windmills, Canal, & Hart Lakes. On the road as you are going to the lakes, the first gravel road on your left gives you access to North Windmill lake. If going to this lake stay on this gravel road and where the road Y's stay to the right/south and as you progress down this road you will see the lake to your left. Follow the road around to the left and you will come to a dead end. At this dead end you will be between the two Windmill Lakes. Hike north a short distance down to North Windmill Lake. 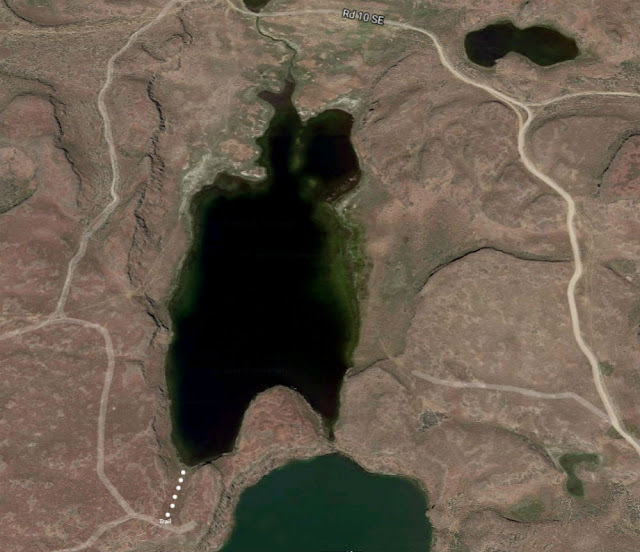 If you stay on the main gravel road and after passing the gravel road to North Windmill Lake the first lake you will come to is Hart lake (to your right/west), Followed by Canal and Windmill Lakes. Maps: To view a map click on google.com/maps . To find any of these lakes on google maps type in the name of the lake followed by the words, Spokane County, WA. Info: Lake access is open typically from April 1 - Sept. 30. ACCESSIBILITY: PARKING... Small gravel, sand, dirt combo parking lot; PATHS/TRAILS... One, not accessible to wheeled mobility devices; RESTROOMS... None. Two fully accessible restrooms not far away at Windmill lake parking area; SHADE/FACILITIES/SHADE… None; DOCKS/LAUNCHES/PLATFORMS… None. Portage down trail and launch off bank; DIRECT WATER ACCESS… No access for wheeled mobility devices; TRANSFER SYSTEMS... None; SENSORY... No sensory tactile markers for those with visual and other impairments; CAMPING... No. Primitive camping allowed at Hart Lake; O.T.H.E.R… Oddities/Barriers: Sand, dirt, rocks; Terrain: Level to about 7% grade; H2O/Water: Water normally murky. Water temperature in the summer can be around 60 to 70 degree. 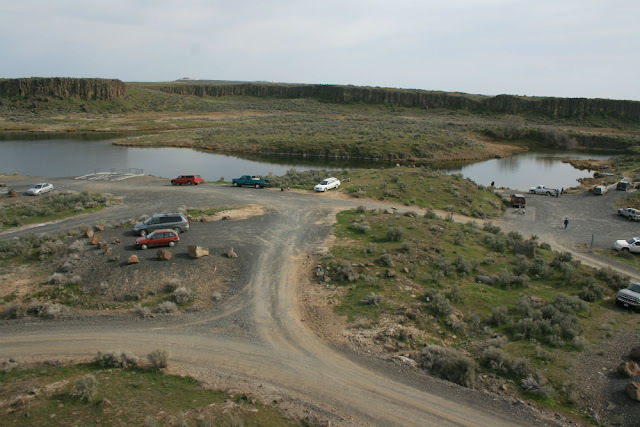 No drinking water available; Environmental Conditions: High winds and hot temperatures in the summer; Resources: Food, drinks, and gas in town of Othello (Wal-Mart) or at Potholes Reservoir resort area. ACCESSIBILITY: PARKING... Gravel, sand, dirt combo parking lot; PATHS/TRAILS... None, Trails not accessible to wheeled mobility devices; RESTROOMS/FACILITIES/SHADE… Two fully accessible restrooms. No designated picnic areas or shaded area. No trees; DOCKS/LAUNCHES/PLATFORMS… One single lane cement launch pad (2 other cement launch pads into Canal and Windmill Lakes) at about 5% grade. Note that in low water times of the year launch pads may not reach the water; DIRECT WATER ACCESS… No access for wheeled mobility devices; TRANSFER SYSTEMS... None; SENSORY... No sensory tactile markers for those with visual and other impairments; CAMPING... Primitive camping area launch. No designed accessible camping sites; O.T.H.E.R… Oddities/Barriers: Lots of sand and deep mud during wet times of the year along shoreline; Terrain: Level to about 7% grades; H2O/Water: Water normally murky. Water temperature in the summer can be around 60 to 70 degree. Drinking water not available; Environmental Conditions: High winds and hot summer temperatures; Resources: Food, drinks, and gas in town of Othello (Wal-Mart) and at Potholes Reservoir resort area. ACCESSIBILITY: PARKING... Gravel, sand, dirt combo parking lot; PATHS/TRAILS... None, Trails not accessible to wheeled mobility devices; RESTROOMS/FACILITIES/SHADE… Two fully accessible restrooms. No designated picnic areas or shaded area. No trees; DOCKS/LAUNCHES/PLATFORMS… One single lane cement launch pad (2 other cement launch pads into Hart and Windmill Lakes) at about 5% grade. Note that in low water times of the year launch pads may not reach the water; DIRECT WATER ACCESS… No access for wheeled mobility devices; TRANSFER SYSTEMS... None; SENSORY... No sensory tactile markers for those with visual and other impairments; CAMPING... Primitive camping area at Hart Lake. No designed accessible camping sites; O.T.H.E.R… Oddities/Barriers: Lots of sand and deep mud during wet times of the year along shoreline; Terrain: Level to about 7% grades; H2O/Water: Water normally murky. Water temperature in the summer can be around 60 to 70 degree. 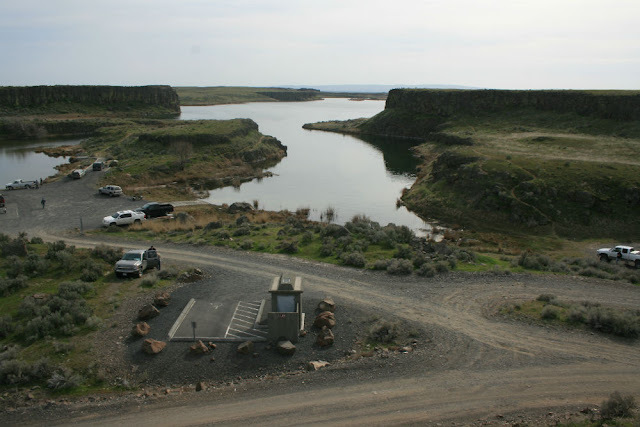 Drinking water not available; Environmental Conditions: High winds and hot summer temperatures; Resources: Food, drinks, and gas in town of Othello (Wal-Mart) and at Potholes Reservoir resort area. ACCESSIBILITY: PARKING... Gravel, sand, dirt combo parking lot; PATHS/TRAILS... None, Trails not accessible to wheeled mobility devices; RESTROOMS/FACILITIES/SHADE… Two fully accessible restrooms. No designated picnic areas or shaded area. No trees; DOCKS/LAUNCHES/PLATFORMS… One single lane cement launch pad (2 other cement launch pads into Hart and Canal Lakes) at about 5% grade. Note that in low water times of the year launch pads may not reach the water; DIRECT WATER ACCESS… No access for wheeled mobility devices; TRANSFER SYSTEMS... None; SENSORY... No sensory tactile markers for those with visual and other impairments; CAMPING... Primitive camping area at Hart Lake. No designed accessible camping sites; O.T.H.E.R… Oddities/Barriers: Lots of sand and deep mud during wet times of the year along shoreline; Terrain: Level to about 7% grades; H2O/Water: Water normally murky. Water temperature in the summer can be around 60 to 70 degree. Drinking water not available; Environmental Conditions: High winds and hot summer temperatures; Resources: Food, drinks, and gas in town of Othello (Wal-Mart) and at Potholes Reservoir resort area.